Well, I’ve done it. I’ve ventured into the realm of gardening. 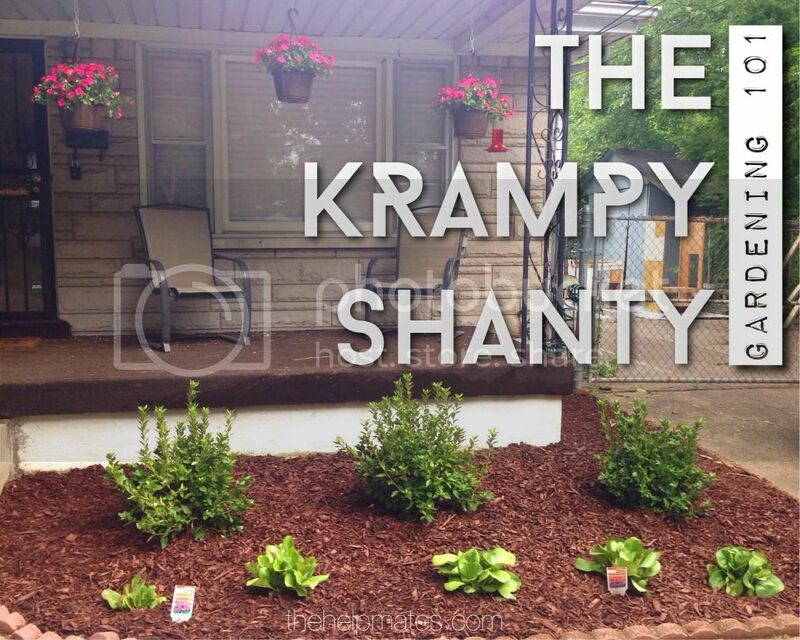 This July when our moms came up from Arkansas to visit, the three of us ladies transformed the first Krampy Shanty flower bed, all while Matt was at work. What a surprise he came home to that Saturday! I’m so glad our moms took the initiative to make this happen. I was planning to take them around sightseeing Louisville, but they came ready to work! 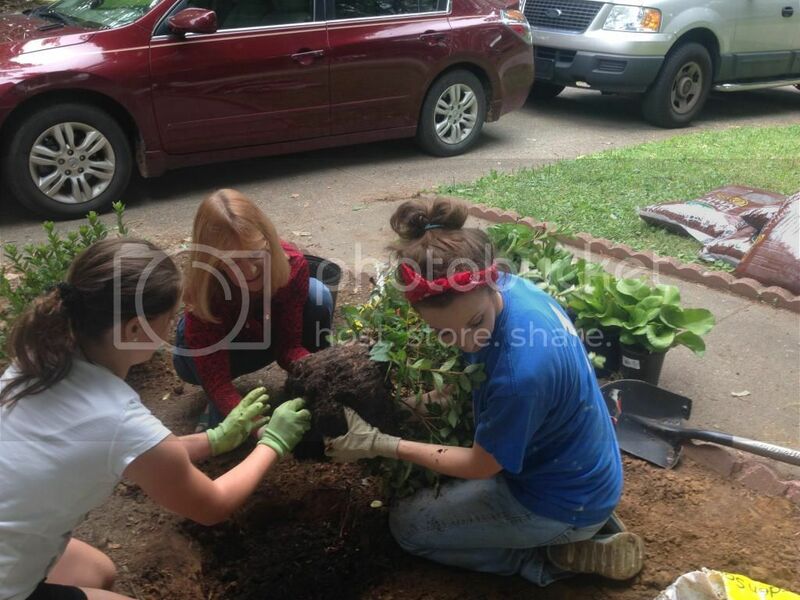 I was blown away by their servant hearts, spending their vacation time working hard in my garden. This was my first real experience with gardening. I have helped plant other people’s gardens and helped weed before, but I’ve never had to know what to do. I always just did what I was told. Now that I’m the one responsible for making sure these little guys live (as best as I can at least), I have been trying to soak up knowledge from all the gardening pros. We started by brainstorming what plants we thought would do well in my front yard. I have a giant pine tree which offers a lot of shade as well as some very acidic soil. 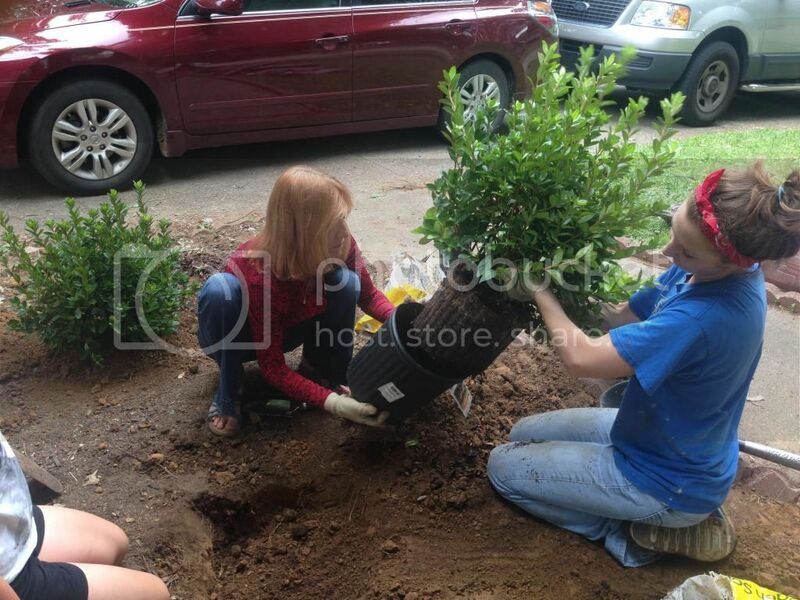 Jodi knew that azaleas did well with acidic soil, so we knew we would probably go that route, maybe with some hostas in front. We looked at Home Depot and Lowe’s and didn’t find any hostas. The good thing about getting out there and just browsing the aisles is that you’ll find plants you’ve never heard of before, or plants that you didn’t know preferred the shade, etc. So we found some bergenias to go in front of the azaleas instead. I’d never heard of these little guys, but I liked the pictures I saw and they seemed low maintenance – something very enticing as a newbie at all this! And their common name is pig squeak! Very apt for my hubby with his Arkansas Razorback alma mater. We added a few hanging plants to the mix, debated mulch colors for a few minutes, then checked out and went home to get to work. 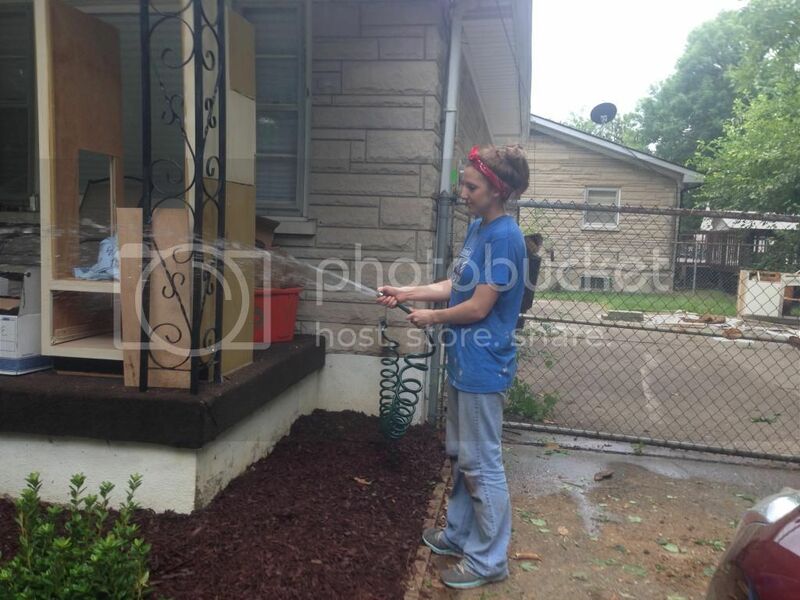 We honestly didn’t have a ton of prep work to do on this flower bed, not because it was in good shape when we bought the house, but because Matt scared some of the neighborhood kids into cleaning it out a few days prior. Our neighborhood has a ton of kids – which we love! Before we ever moved in, when we were just over here working on the house, some of the neighborhood girls stopped by to chit chat and then asked if we had any candy for them. I explained that we didn’t even have a fridge for food at this point, much less candy. I told them that I would bring some candy when we actually moved in and they could stop by and get a piece as long as it was ok with their parents. Moving day came and they showed up ready for their candy! As promised, I gave each girl 1 piece of candy. It didn’t take long for the kids to look at us and see Jolly Ranchers instead of their new neighbors. Kinda creepy to be known as the house that gives out candy to kids, but we kind of walked right into that one! He said they looked like little deer caught in headlights. I guess a big bearded man can be quite intimidating to 5-9 year old girls. We joked that this would be a good test of our future parenting skills! 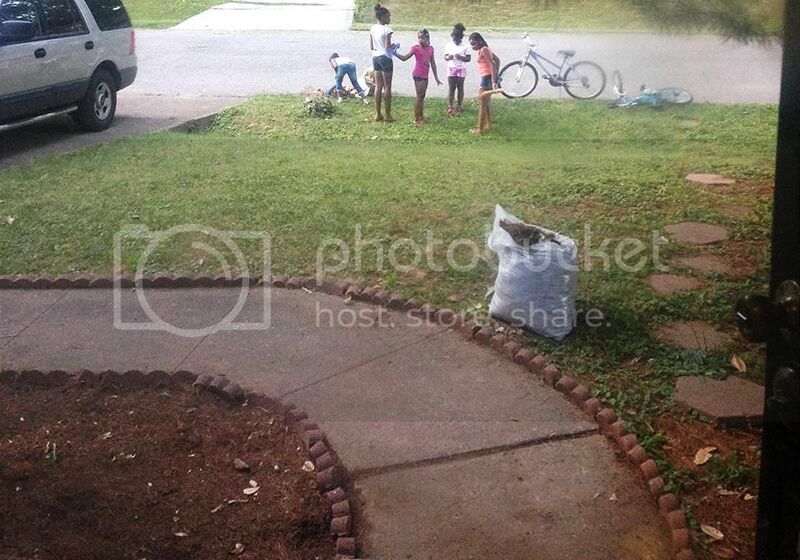 Not only did they clean up the trash, but they started doing some yard work on their own accord. They picked up pine cones, bagged pine needles, and cleared out the entire flower bed to where it was just about ready to plant! We’ve since quit handing out candy, but we were extremely thankful for all the help on the garden prep! 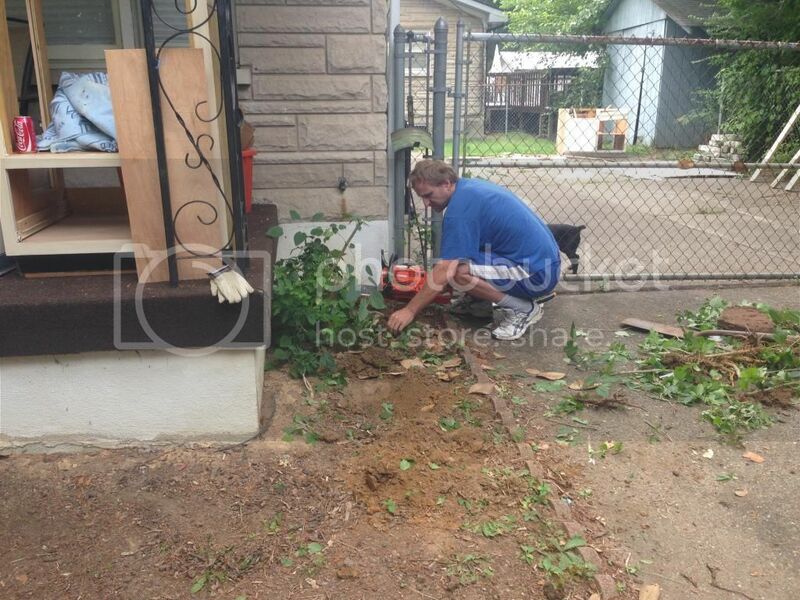 Once we got home we started by digging out the few remaining ‘plants’ AKA giant weeds that were left. It took a little help from our kind neighbor and his chain saw. 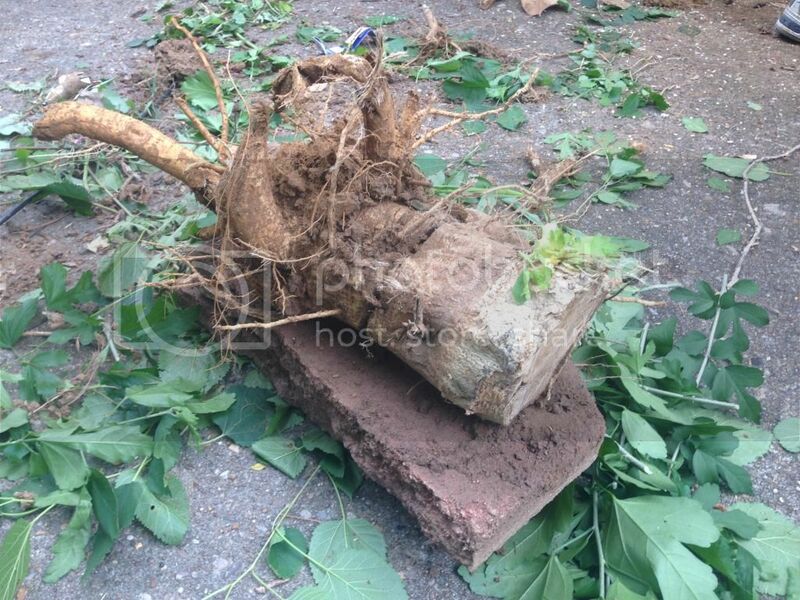 Look at the root of that weed! I mean, that’s a tree trunk! 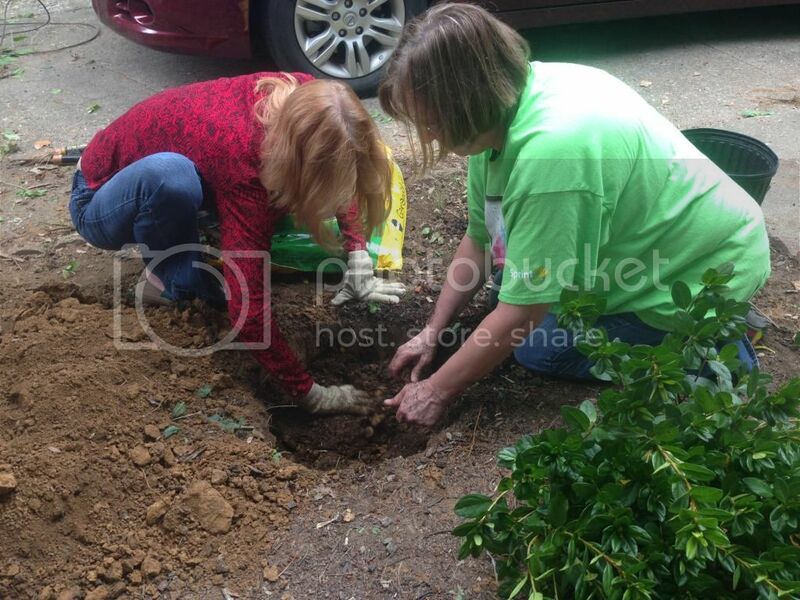 Then we placed our azaleas and bergenias where we wanted them to go before we began digging. That way we could get the spacing right. 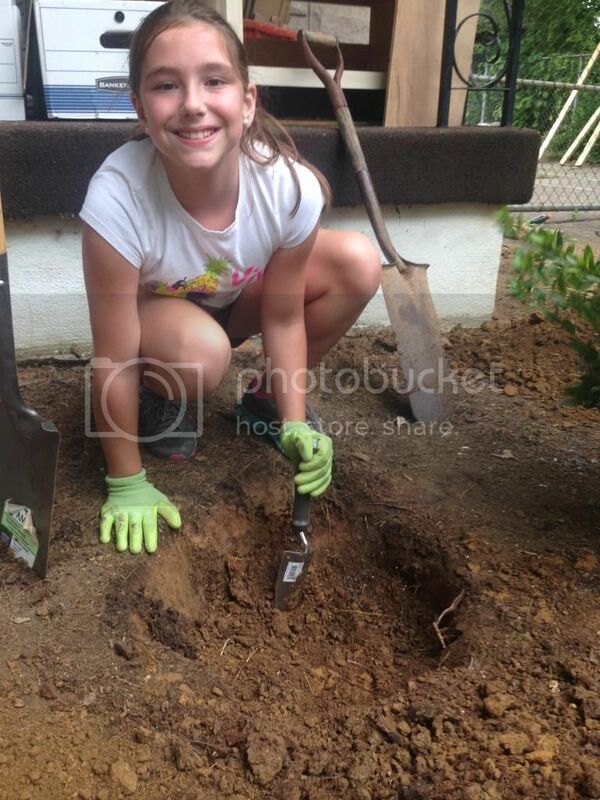 We had some help from our adorable little hard-working neighbor, Gracie. 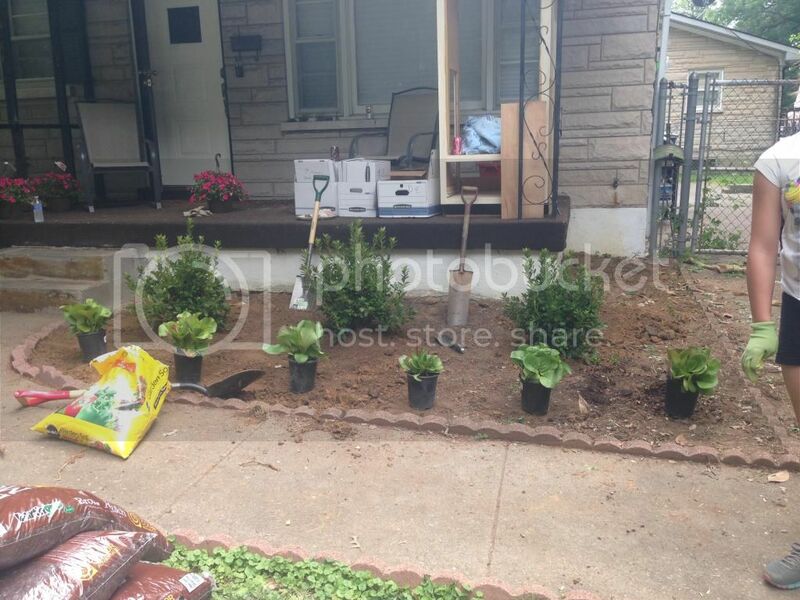 After a hole was dug, we added a mixture of new potting soil with the existing soil. This way the roots have some loose soil to easily grow into. 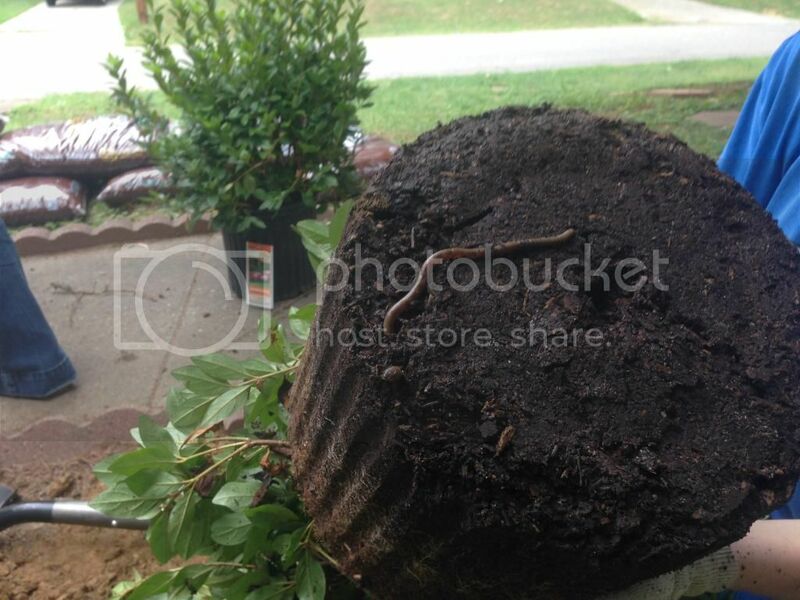 We loosened up the pot bound roots so they would thrive in their new home. We had a little help from some squirmy friends. Mulch time! 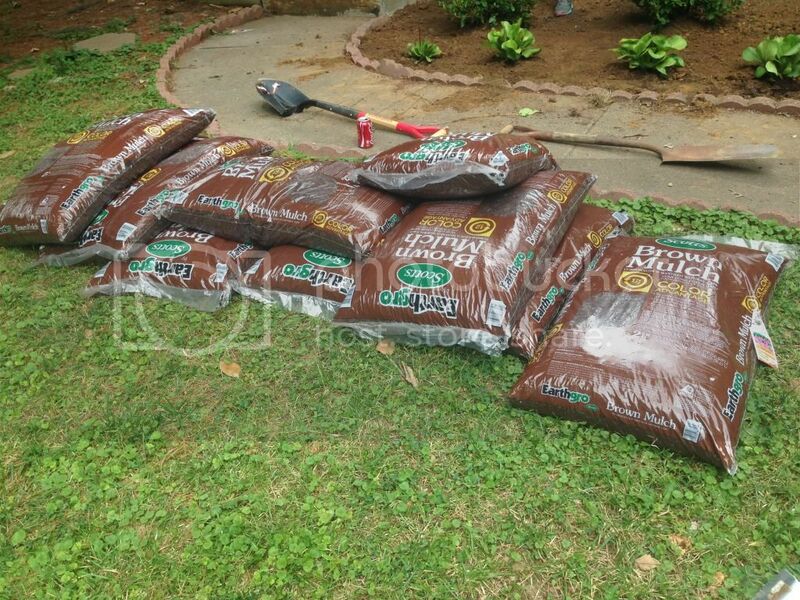 Always, always, always over guess when it comes to how much mulch you’ll need. Lucky for me, our moms advised me well, so we had 2 bags extra when all was said and done! I went back and forth between the red and brown mulch. I’m glad I decided on brown in the end. 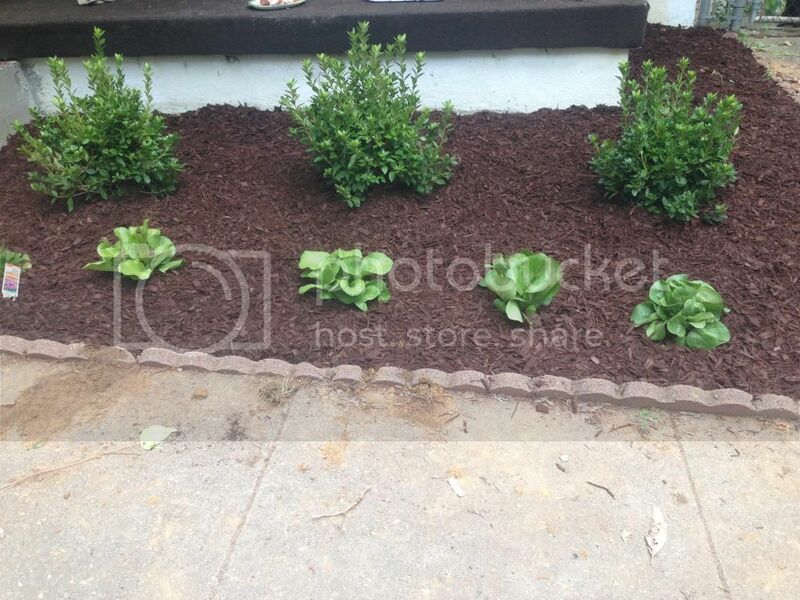 The brick border we already had was red, so I think that red mulch would have been an overload. 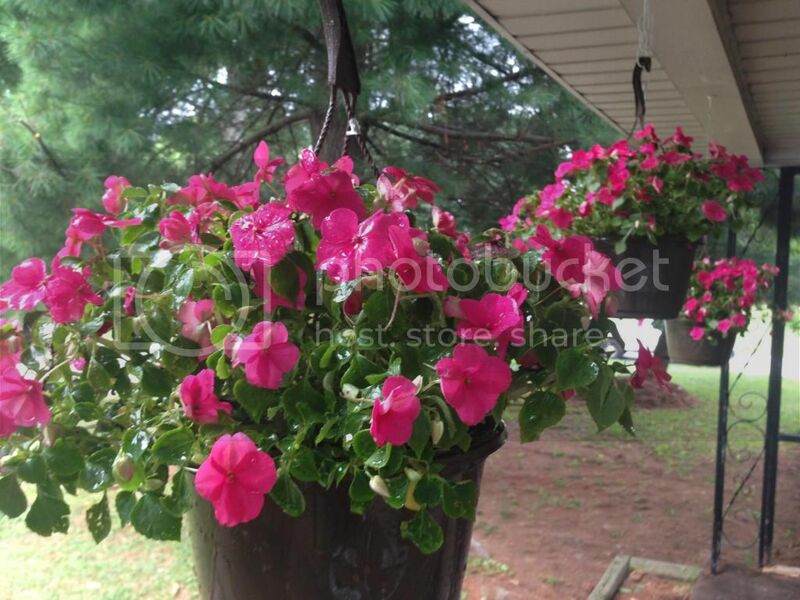 We added a few impatiens as hanging plants on the porch. I know the azaleas and bergenias won’t bloom until next year, so I’m glad we went ahead and got the hanging plants so we could experience some color now. 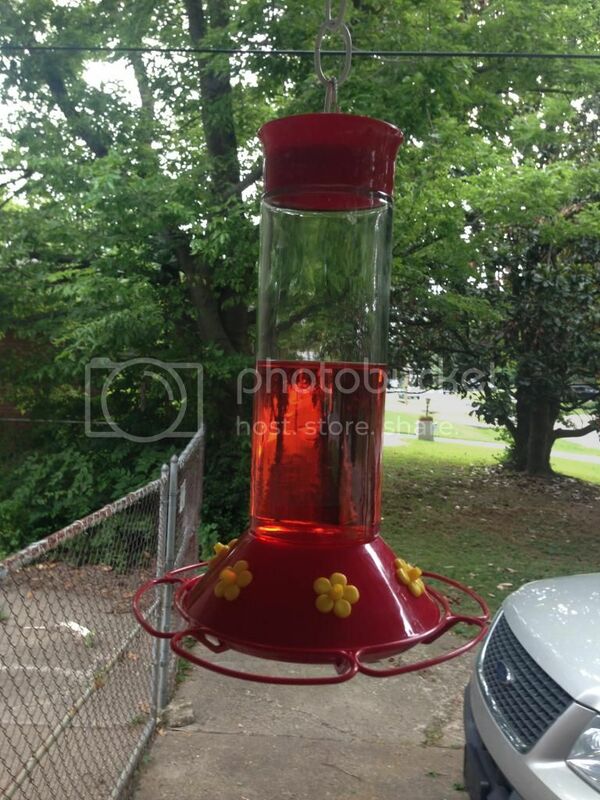 And of course a hummingbird feeder was on the shopping list. We gave everything a nice watering, and called it a day! Thanks for reading about my first gardening experience! I’ll post some updates as the seasons change, but I’m not sure how many tips I’ll have since I’m just getting my feet wet. 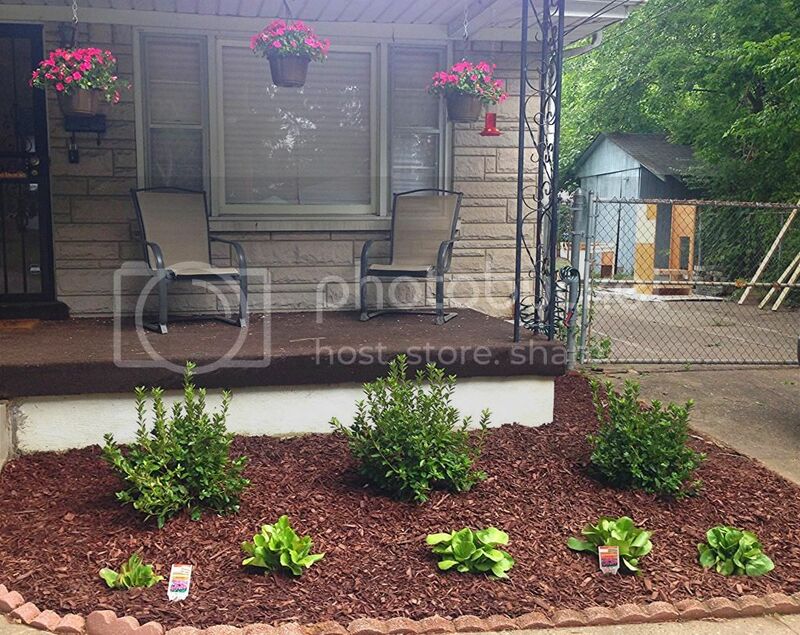 Cara, your Mom told me she helped with the gardening and my it looks so good! Thanks for sharing this new adventure-love it!